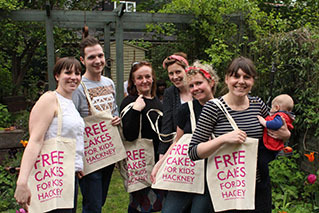 As modeled by our beautiful committee above, we are selling our iconic Free Cakes For Kids Hackney tote bags at the bargain price of £6.50 (including postage and packaging within the UK). You can buy yours through Local Giving – just click on the link below. When using Local Giving, please note it is very important that you put “Tote Bag” in the subject line and include your address details in the space left for messages or we won’t know where to send your lovely bag. Support Free Cakes For Kids Hackney and buy your bag today!